Washington University in St. Louis engineers have developed a high-powered fuel cell that operates at double the voltage of today’s commercial fuel cells. It could power underwater vehicles, drones and eventually electric aircraft at a significantly lower cost. This is an artistic representation of the pH-gradient enabled microscale bipolar interface (PMBI) created by Vijay Ramani and his lab. The two layers that make up the interface are covering the third bottom layer, which is the electrode with palladium particles on it. 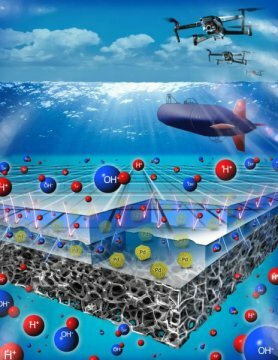 The submarine and drones are envisioned applications of the direct borohydride fuel cell which incorporates the PMBI. Image Credit: McKelvey School of Engineering, Washington University. Click image for the largest view. The paper detailing the advancement using a unique pH-gradient-enabled microscale bipolar interface (PMBI), has been published in Nature Energy. The improvement could power a variety of transportation modes – including unmanned underwater vehicles, drones and eventually electric aircraft – at significantly lower cost. The fuel cell uses an acidic electrolyte at one electrode and an alkaline electrolyte at the other electrode. Typically, the acid and alkali will quickly react when brought in contact with each other. Ramani said the key breakthrough is the PMBI, which is thinner than a strand of human hair. Using membrane technology developed at the McKelvey Engineering School, the PMBI can keep the acid and alkali from mixing, forming a sharp pH gradient and enabling the successful operation of this system. Other participants in this work include Cheng He, a doctoral candidate, and Javier Parrondo, a former research scientist in Ramani’s lab. The team is working with the university’s Office of Technology Management to explore commercialization opportunities. Double the voltage is always a good thing at the levels where fuel cells and batteries work. Cars, trucks, ships and trains are good prospects, but flying might prove more of a challenge. But never say never, the past decade here has been both a surprise and disappointment on what comes to market. This is a new thought. If it is widely used, the environment will be better. Technology has been developing and we need to pay attention to the environment.